Thinking of visiting Scotland in April, or early spring? So, how much of a gambler are you? No, the poet meant something about spring starting to awaken memories and expectations deadened by the winter. Nevertheless, the phrase is widely associated with the fourth month of the calendar. It’s potentially treacherous but can be brilliant. If your own expectations for your Scottish trip in April include, say, sunshine, gambolling lambs, bursting buds and, uhmm, skylarks with wings a-tremble in the pasture - maybe red grouse wings a-tremble in the heather would be better - you may get all of these. On the other hand, it could snow when you’re here. Yes, it certainly can be the cruellest month - expectations raised, then dashed...unless you’re a skier perhaps. I came to this conclusion by looking through all the pics I had taken of April scenes over the years. So, I’m going to share some of these and you can judge for yourself. In upper Deeside, looking north on the road between Braemar and Inverey. The meltwaters of the Quoich run down to join the young River Dee. Still some snow on the Cairngorms above. DATE: 13 April 2007. First of all, here’s a fine scene in upper Deeside (Aberdeenshire), a little way west of the village of Braemar. Spring-like features obviously include a calm blue sky, snow retreating on the high ground and a kind of purplish haze on the birches as the buds swell. It’s one of my favourite views in Scotland as well. But, hang on, there's more. To prove how warm it is, I also have to show you the picture taken a few minutes earlier in the village of Braemar. Scroll down and, if you look closely, you can see a lady in short sleeves and even a wee boy in a sun hat, though that’s after you observe the sunbathing ducks. It’s not even half-way through April. Braemar is at comparatively high level, in the hills, and is often one of the coldest places in Scotland in the winter, statistically speaking. 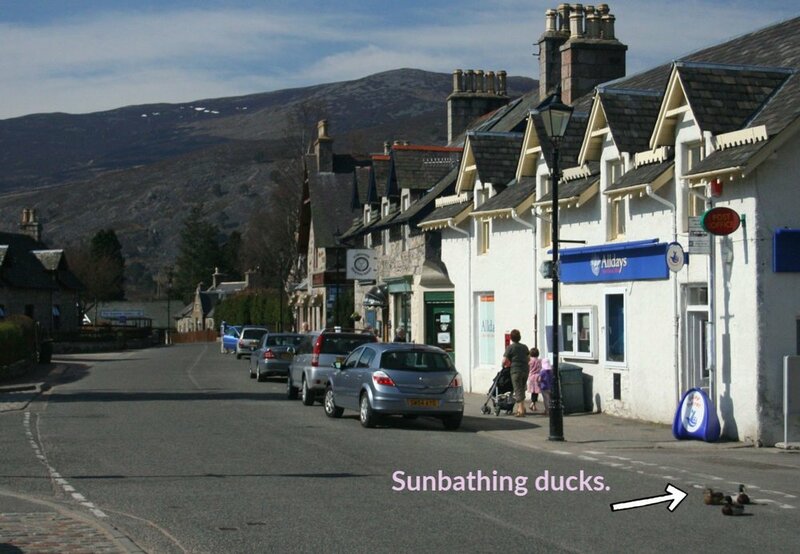 That day, the ducks had made it to town and were sunbathing on the main street. And I mean several ducks, not just the ones in the pic below. My final proof that it can be freakily warm sometimes in Scotland. Braermar main street and the ducks are feeling the heat. (They are also, unaccountably, feeling the street.) DATE: As above 13 April 2007. Now let’s jump forward a decade. It’s still April, later in the month than the sunny pics above. Yes, that’s the sea, out there somewhere in the murk. The sheltered and soft Moray Firth coast in fact. DATE: 23 April 2017. Can you believe it? It’s snowing, east of Inverness and down by the sheltered Moray Firth coast, usually a bit milder than the upland location of Braemar. It’s a backyard view that won’t make it into a tourist brochure (to be fair, even if the sun had been shining!). The sea is barely visible beyond the snowy line of shingle. Basically, anything between heatwave and snow may happen during April here in Scotland. But - listen up - and this might be the most important sentence on the page: I can’t ever remember being bitten by midges in April! Usually, by April is starting to green up, as the picture below of the Tweed Valley and the wee town of Innerleithen suggests. I may have whacked up the colour saturation here though - and note that there are no leaves yet on the trees in the foreground. To me, it looks exceptionally vivid for April! But the new greens of the season are very pleasing. Looking west up the valley of the River Tweed from the edge of the village of Walkerburn towards Innerleithen in the Scottish Borders. DATE: 28 April 2011. OK, it’s late on in the month. Higher up, of course, the colour of the hill right of centre is still a reminder that winter only let go a few weeks before. The heather shoots haven’t really got going. It’s still mostly browns and tweedy shades up there on the moorlands. Higher still, snow cover these days never seems to be the same for two consecutive years. Check out the gallery further down for an indication of just how little snow can be encountered by April. This is Armadale, actually Armadale Bay. Not the Armadale in West Lothian, nor the one on Skye, but the one in Sutherland, on the north coast. It’s early in April, a long way north, but the gorse is bright. DATE: 8 April 2012. For the casual, wayside - as opposed to high-level - observer it looks like yellow again - daffodils of course, plus primroses and cowslips. Bluebells (ie English ones!) tend to be later, Scots bluebells later still. There should be blackthorn in bloom on bare twigs, ahead of hawthorn in May. Red campion is brightening up coastal scenes but, taken altogether, April still feels, well, early. Kittiwakes, St Abb’s Head, Scottish Borders. DATE: 9 April 2014. As for birdlife, it’s a strange sort of month hereabouts, with the first swallows arrival overlapping with the last grey geese who have been here for the winter and are drifting off to their northern breeding grounds. Usually, the local press runs stories about ospreys arriving and returning to their nest sites - I suppose that’s the equivalent of the ‘first cuckoo of spring’ correspondence that used to feature in English newspapers. Activity at the big seabird colonies is beginning to gather pace, as I see from a St Abb’s Head picture from 2014 - though my pic collection tells me not a puffin was to be seen near Faraid Head in Sutherland around the same point in the month in 2012. That was just a little too early in that year perhaps - but it’s a point worth noting if you are going to be puffin spotting in Scotland. Aren’t wheatears handsome? Eyemouth, Scottish Borders. DATE 24 April 2011. And it was a lovely day on the walk from Burnmouth to Eyemouth. Click the picture for more details on that route. You’d enjoy it. 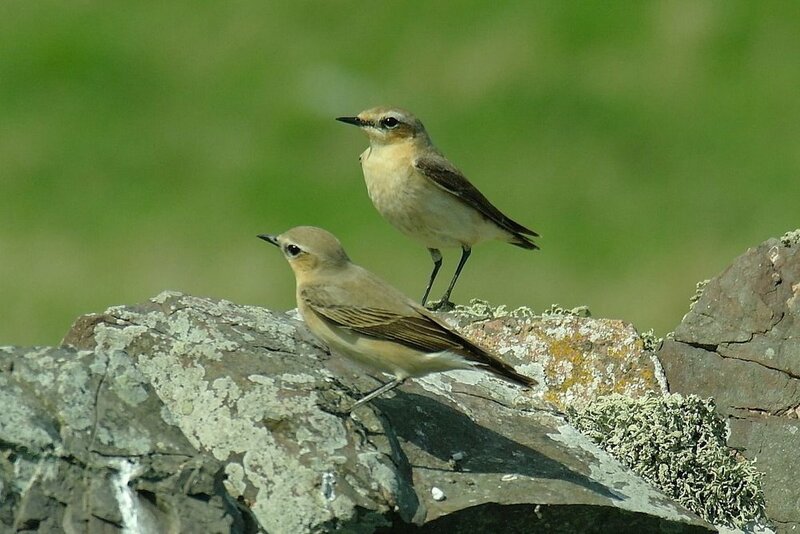 If you have definite birdy inclinations, then as well as the arrival of ospreys and the like, the hardiest of the wee birds that visit in summer, for example, wheatears, should be passing northwards along the coasts. They are real ‘harbingers of spring’ and quite dashing as well (at least I think so). Whatever the weather (or possibly wether), there will also be endless sheep photo opportunities. Clearly, at least one of these lambs belongs to the mummy sheep in the picture. Two minutes from the main A1, Scottish Borders. DATE 21 April 2011. Should you visit Scotland in April? Definitely - though Easter’s movable date complicates any predictions as to how busy it will be in any given year. The advice to pack flexibly is often given for a Scottish visit. This is especially true of April as I am sure you will have by now worked out. On an average year - and there is no such thing! - it might be bright, there will be showers and it won’t be very warm. But on the other hand, it is unlikely that weather will get in the way of your trip plans. Attractions that close for winter will also be open - how early in the month though can depend - again - on when Easter falls. If you are intending to hire a vehicle to go car touring in Scotland to catch the best of the season, then take a look at rental prices on that link. (There’s also a booking form right at the end of the page.) Or, you could let someone else do the driving. Small group Scottish tours with friendly knowledgeable drivers (guaranteed) are another option. Weather in general at this time of year in Scotland? Well, this far down the page you’ve probably got the message. Chances are, you’ll probably get a bit of everything. Another point to keep in mind is that in some years the east coast can get really cold easterlies blowing across the North Sea. In this case, often the far west enjoys beautiful conditions, though not necessarily warm ones! If possible you’ll want to avoid the teuchat storm. That’s our phrase for the bad weather in early April associated with the teuchat - in English, lapwing - when this bird of wet pasture and seashore lays its eggs. Mind you, if you miss the teuchat storm, you might catch the gowk storm. That one coincides with the arrival of the first gowk - in English, cuckoo. And if you miss both of these it’ll probably be time for the gab o Mey. That’s the last of winter - a short period of bad weather right at the beginning (gab here meaning, in the Scots language, mouth) of May. See, there may be no escape as all these phrases are part of Scottish rural folklore! Hey, they’re a lot more colourful than ‘April showers’ - though that’s a phrase that has real meaning here as well. Down the page a wee bit is a gallery of April in Scotland pictures. Take a look. The peaks of Inverpolly , north of Ullapool in the north-west Highlands, 29 April 2007. It’s already 30 April (2013), but little sign of greenery here! Peak of Ben Lomond top left. Near Laggan, by the road connecting the Great Glen with the main A9, early April that year saw plenty of snow on the tops. DATE: 9 April 2012. Pease Dean, south of Dunbar, but in the Borders, is a lovely and overlooked stretch of sheltered semi-natural woodland. By mid-month , the blackthorn is out, white on the bare twigs, but even the sycamore has hardly got going. DATE: 16 April 2011. Near Rattray Lighthouse, between Fraserburgh and Peterhead, there are long sandy beaches. The sky is blue, but the wind is easterly and bitter! DATE: 16 April 2010. Again, it’s the gorse that brings the colour. The river is high with meltwater and the trees are still in bud. DATE: 28 April 2018. A reminder that not all spring flowers are yellow! Wood anemone are quite widespread, usually below trees as the name suggests. Clava Cairns (in the background) are near Culloden Battlefield, by Inverness.